Can a Felon Become an OSHA Inspector? Often, felons must look at different career path after leaving prison, including returning to school for additional education. While serving their sentence some felons might consider a career in safety and the construction industry and could explore a career as an OSHA inspector. 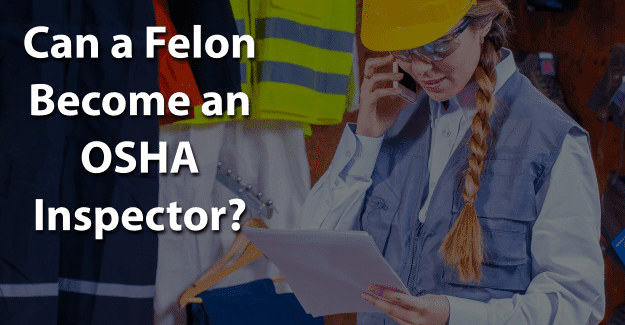 This blog post will address the issue of whether or not a felon can become an OSHA inspector. What is an OSHA Inspector? What Education/Training Does an OSHA Inspector Need? How Much Does an OSHA Inspector Earn? The Occupational Safety and Health Administration (OSHA) is a government organization designed to reduce workplace injuries and hazards. This agency carries out inspections on work sites to ensure employers and employees follow workplace safety regulations. An OSHA inspector protects workers through identification of unsafe working conditions and business practices. He or she deals with a wide range of issues from biochemical hazards to the safety of office workers. Each type of inspector visits private and public facilities to inspect compliance with federal health and safety laws. An industrial hygienist provides advice regarding environmental issues such as noise, while hazards, and dangerous chemicals. A safety engineer reviews proposed designs, methods, and procedures. He or she also provides advice regarding technical compliance with health and safety laws. A safety and occupational health specialist focuses on employee comfort, including ventilation, lighting, and equipment along with safety and emergency preparation training. Certification is not required to become an OSHA inspector, but it makes a significant difference in being able to get a job in this area as many states are in the process of enacting such requirements. Most certification programs require a relevant college degree and some work experience. Job safety and health programs require inspections to ensure employer compliance with safety regulations. Inspections help identify circumstances that present a risk and danger to employees. To become an OSHA inspector, formal education requirements and specialized training are necessary. In addition to the required education, an OSHA specialist can first work as an OSHA technician. To become a safety technician requires at least an associate’s degree from a community college or vocational school. Certification can be obtained from the Board Certified Safety Professionals (BCSP). While certification is voluntary, many employers look for employees who have this certification as it offers a higher standard for the company. The American Board of Industrial Hygiene offers a certification known as a Certified Industrial Hygienist (CIH). According to the U.S. Bureau of Labor Statistics, there were approximately 83,700 individuals employed as occupational health and safety specialists in 2016. The median annual income for an occupational health and safety specialist was $71,780 in 2017. Salary varies based on years of experience, area of country, and certifications. Typically, those with more experience who are also certified will earn more than those who are not certified. Employment of occupational health and safety specialists is expected to increase by approximately 8% between 2016 and 2026. Specialists and technicians will be required to work in various industries and government agencies to deal with existing and new safety regulations. A felon can pursue any degree he or she wants. Approximately 60% of colleges consider criminal history in their admissions process, although there is no standard policy regarding a background check. Any felon that wants to get a degree in preparation for becoming an OSHA inspector can find a college that will accept him or her. A felon may have difficulty getting accepted into many schools, but there are programs that will accept a felon. Another thing to consider is whether or not a felon will be able to become certified after completing a collge degree. It’s important to be honest while filling out an application when applying for school or certification. If a felony isn’t disclosed but is found on a background check, this constitutes fraud and is punishable. It’s a crime to falsify an application, which could result in being sent back to prison. Having their felony expunged can give them the chance needed to begin with a clean record and succeed in becoming an OSHA inspector. Expunging a criminal record allows anyone to honestly state on an application that he or she has not been convicted of a crime. It’s a big challenge, but it might be worth it for a felon wanting to become an OSHA inspector. Having his or her record expunged and also documenting any training programs or additional education could make the essential difference in a felon succeeding in becoming an OSHA inspector. What do you think about this blog post? Have you or someone you know been in the situation of trying to become an OSHA inspector with a felony? What was that like for him or her, and how did he or she achieve success? Please tell us in the comments below.